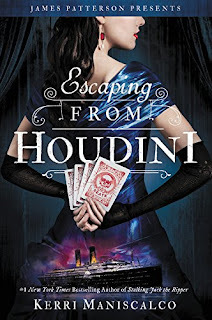 Escaping from Houdini, the latest YA history mystery thriller by Kerri Maniscalco is released today. But then, privileged young women begin to go missing without explanation, and a series of brutal slayings shocks the entire ship. The disturbing influence of the Moonlight Carnival pervades the decks as the murders grow ever more freakish, with nowhere to escape except the unforgiving sea. It's up to Audrey Rose and Thomas to piece together the gruesome investigation as even more passengers die before reaching their destination. But with clues to the next victim pointing to someone she loves, can Audrey Rose unravel the mystery before the killer's horrifying finale?. Escaping from Houdini can be purchased on Amazon.com (U.S.) and Amazon.co.uk (UK). Below are a few more fictional shipboard adventures of Houdini. 2 YA Houdini books one after another with The Art of Escaping by Erin Callahan. Young Adult Houdini related books may be a trend. Great to get youngsters interested in Houdini and Magic. PS Our record breaking Haunted Seance show begins again in October and we are setting up our annual Halloween "Original Houdini Seance" which will be announced soon.